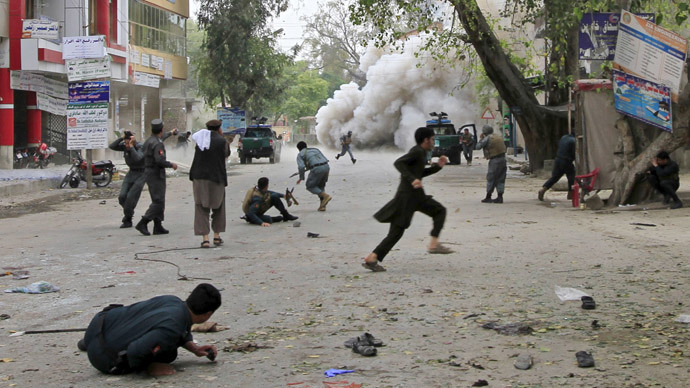 At least 33 people have been killed and more than 100 injured in a series of explosions in the eastern Afghan city of Jalalabad, according to police and local media. ISIS has claimed responsibility. A blast took place outside a local bank, police chief Fazel Ahmad Sherzad told Reuters. The attacker was riding a motorbike and detonated his explosives while military personnel and civilians were waiting to receive their salaries from the bank, Sherzad said. Brutal images of the injured and the dead at the scene have been circulating online. According to some reports, the first explosion was shortly followed by another blast. At least one suicide bomber was reportedly involved. Witnesses heard a third blast, but according to local media reports it was a controlled explosion by authorities, who detonated another suspicious device. The Islamic State (IS, also known as ISIS or ISIL) extremist group has claimed responsibility for the attack, according to the Afghan Pajhwok news agency, citing the group’s spokesman. Shaidullah Shahid a spokesman for #ISIS in the region in a text message climes responsibility of a blast in shrine in #Jalalabad city. Earlier, Taliban denied involvement, condemning the attack. "It was an evil act. We strongly condemn it," the Taliban spokesman, Zabihullah Mujahid, told Reuters. Ambulances have reportedly been carrying numerous dead and wounded from the scene, while people have been rushing to donate blood to the victims. Moments a go Pres. Ghani arrived in #Badakhshan , he condemns this cowardly and heinous terrorist attack on civilians in #Jalalabad. Local authorities, cited by Pajhwok news agency, say they expect the number of casualties to grow.